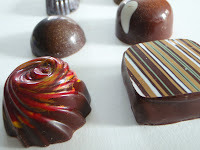 I first heard about Christopher Elbow Chocolates in a Food and Wine article about Kansas City. At the time, the existence of those chocolates seemed irrelevant—living in NY and having no immediate (or distant) plans to travel to Missouri. But I found that particular article memorable, because Mr. Elbow started selling his wares from a counter in a furniture store before opening up his own little chocolate boutique in KC. Then last fall I noticed a new (or at least it wasn’t there the summer before) addition to the shops in Hayes Valley. Behind a few extraordinarily large plate glass windows, marked with a simple albeit massive letter E, were rows of truffles, and behind the chocolate counter, an espresso machine. I didn’t venture in. I was afraid of what might happen if I were left unattended in the store, so I decided to wait until the Wife could accompany me. (Turns out, this really wouldn’t help matters at all.) We stocked up on the return trip, because by that time, we knew how good they were without ever setting foot in the shop. Our friend Chris (who is also a law ninja and co-worker of Beta Wife) presented us with a box of chocolates as a gift, the outside of the box marked with the now familiar “E.” We opened the lid to find an assortment of carefully crafted truffles that looked so fancy, we weren’t sure if they were for eating or for looking. They came with a little identification book telling us what each chocolate was filled with, and on the outside was the name Christopher Elbow. We made our way through the box over the course of a week. Now every few months I make the trek over from the East Bay to get my fix. In the Hayes Valley store the walls are lined with shelves of chocolate bars and other treats, but so far I haven’t made it past the truffles. In fact I don’t think I even noticed anything on the walls until my last trip there. Having no self control in the presence of well displayed goodies, I always hover over the counter until I reach my spending limit. The most delicious of all the chocolates, I have decided, are the turtles. 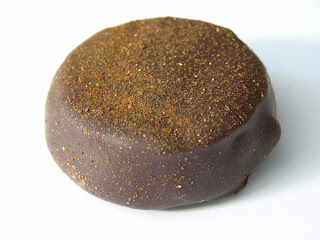 I had never really been a fan of chocolate turtles until I tried one of these perfect little nuggets. Salty and caramely, but not too chunky. 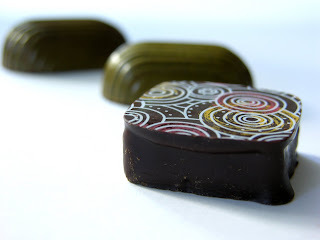 My second favorite is the Bananas Foster truffle that tastes like someone wrapped up a little tiny Banana Foster and crammed it in a chocolate bite. Magic was undoubtedly involved. And speaking of magic…you might want to try Mr. Elbow’s recipe for Chocolate and Whiskey Liquor (Food and Wine, Dec 2005). No, let me say that another way. You absolutely need to make this stuff. It’s ridiculous. Make it for you next dinner gathering, and suddenly you will have extra friends. Irish cream liquors taste pale and sickly in comparison.